Excessively small for its scale, but the figure is good. Most vehicles designed for 3 3/4" scale figures are underscaled, but this A-10 must be the smallest ever. It'd be more believable as a 2.5" figure scale vehicle. The detailing is pretty good, though, and they were thoughtful enough to add a fold-down handle on the tail (presumably for kids to fly it around easier). For some reason, the nose gun is a spring launched missile, but the bombs & missiles are attached via tabs. The A-10 would probably look all right toward the back of a diorama or hung from the ceiling, but it's weak as a toy. The Blair figure is pretty good, even though the head isn't a great likeness of Moon Bloodgood. Her helmet fits well, the pistol is decent, and she's fairly poseable. 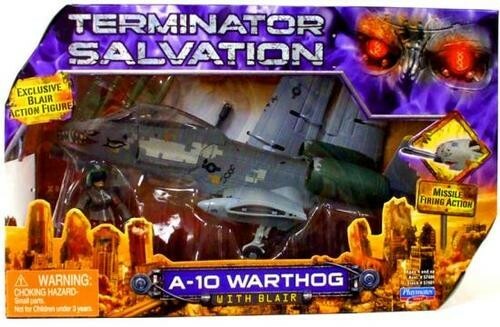 The figure gets both stars of my two-star rating; I'd skip this A-10 if there were no figure.